Join us this year to celebrate four decades of the IEEE Symposium on Security and Privacy. We have several fun things planned this year. Buttons will be activated and further details provided as we get closer to the events. A plenary session on Tuesday will celebrate four decades of S&P, featuring a special panel and ending the day with refreshments and cake! We start a new S&P tradition this year, with the inaugural IEEE Security & Privacy Test of Time awards. On Tuesday, we will present two sets of awards: our first, annual Test of Time awards, and a special set of Test of Time Awards to recognize papers from the first fifteen years of Oakland, which fall outside the window of consideration of our annual award. Throughout the symposium, we will run a treasure hunt with trivia and puzzles. The top 40 on the leaderboard win a prize! The IEEE Security & Privacy magazine is offering a number of free articles to registrants of the symposium in honor of the conference's 40th anniversary. Our 40th S&P features a record-setting program of 84 papers. Below, you can explore how the symposium's technical program size and acceptance rate has changed over time. Data is taken from the PC Chair's opening remarks, when available. 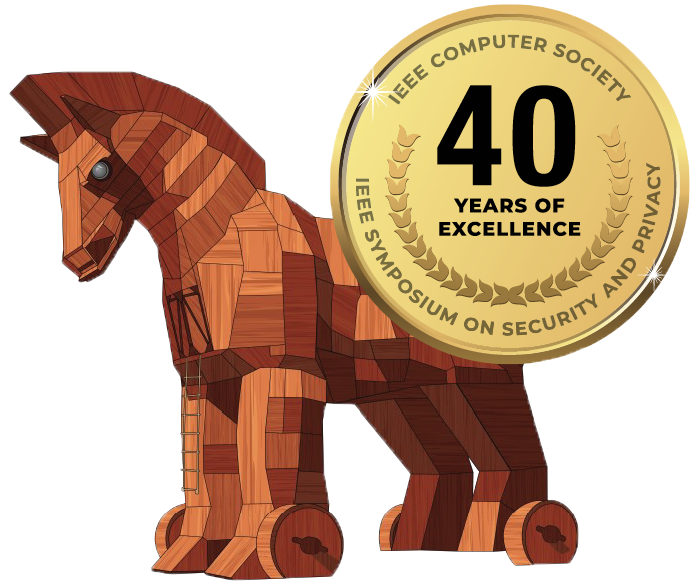 The IEEE Security and Privacy "Test of Time" award is intended to recognize papers published at IEEE’s flagship security conference that have made a lasting impact on the field. To qualify, a paper must have been published at the IEEE Symposium on Security and Privacy (“S&P”) between 10 and 12 years prior. Each year, the awards selection committee is charged to select one or more winners from among the eligible set using their own experience and knowledge. In the first years of the Test-of-Time award we also are including “catch-up” awards for the earlier years. This year we are honoring papers from the first fifteen years that have made a lasting impact on the field. In subsequent years, more recent papers will be honored. The selection committee was chosen independently of the regular test of time committee, with particular attention being paid to including people who are familiar with Security and Privacy work during that era.